There are no cables between the chin rest and the light tower, and the wire to the light tower is exposed for easier maintenance. 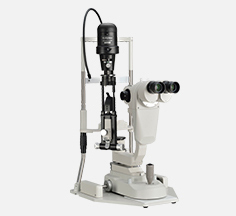 Halogen color LED light source A LED light source which wavelength is much closer to a halogen lamp has been employed to give the slit lamp a bright, natural color. This eliminates the need for a filter to remove the common “bluish LED light” problem. 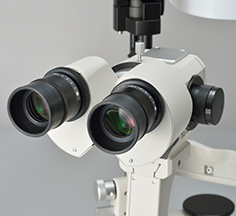 Background illumination is provided in the arm unit of the microscope. In addition to adjusting the brightness, the conveniently positioned illumination knob can turn the illumination on and off quickly and easily. Detachable background illumination is available as an option. Simple slide operation makes it easy to insert and extract barrier filters. High contrast fluorescence images can be captured when a blue (exciter) filter is used. A new plate is employed for stress-free smooth focus adjustment. 15°tilting angle allows observation with a natural posture for taller users. Also possible to reduce the angle for shoter users. Both still images and movies can be captured by dynamic range CMOS camera with a simple joystick operation. User-friendly, easy-to-view layout to suit wide monitors original imaging program MW File is atandard accessory for digital set.